End of the cul de sac privacy, yet so close to east Redding urban amenities and shopping! Spacious family room with vaulted ceiling and slider access to back patio with pergola over spa. Woodstove in parlor/livingroom at entry. 504 sqft 2 car garage. Solar water heater system. Easy access to highly sought-after Misteltoe School. Call now for a private showing! This entry was posted in New Listing, Redding and tagged Mistletoe School, New Listing, Redding on July 26, 2017 by Skip@RHB. This home is in escrow Pending Sale. It went into escrow almost immediately after listing. 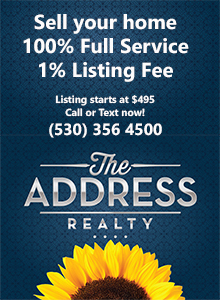 We can sell you Redding area home too, and we do it for Just 1%. Listing in the Shasta MLS starts at $495. Ask us how we can sell your home. American Craftsman inspired contemporary home in Sunset Avenues! Enjoy the best of west Redding from your well appointed home in this great neighborhood. Hillside setting creates a very private feeling for indoor/outdoor living. South facing home orientation offers cool covered back patio afternoons and evenings. Enormous windows in back of home flood the living areas with northern light. Gas fireplace in great room anchors seating area at picture window. Transom window lighting throughout enables light circulation and adds spacious ambiance to every room. Split floorplan for comfort and privacy. Office can be used as a 4th bedroom, accessed directly from double doors at the entry. Extra large RV parking area and pad behind gate.Gigantic 719 sqft finished 3 car garage. Vinyl fencing surrounding the completely landscaped yard. Tall trees adds to the private feeling of sanctuary and shade. Extensive crown molding and wood wrapped windows augment the Craftsman-like style details on the exterior. Newer stainless appliances. Recirculating hot water system reduces water waste. Whirlpool garden tub in master. Fire sprinklers for family safety. Large wooden outbuilding at end of RV pad with power. Very near Sunset Marketplace for shopping and services. Easy access to Redding’s extensive trail system. The Buenaventura Trail is only a block from this home, and accesses the Sacramento River trail after a 3/4 mile hike down the hill. Minutes from Whiskeytown Lake. A superior home for either entertaining or solitude. Homes in this west Redding neighborhood don’t often come up for sale. Sellers need to move closer to family. This entry was posted in New Listing and tagged New Listing, West Redding on July 10, 2017 by Skip@RHB. Home in Windsor Estates reduced to $239,900! Beautiful 4 bedroom in desirable Windsor Estates. Features 3 car garage. Ample parking including small RV or boat, and beautifully landscaped backyard with 2 outbuildings. Soaring vaulted ceilings and architectural ledges contributes to the bright and spacious feeling. Need an office? Another great feature of this home is the bedroom directly off the entry has double doors and could easily be an office, den, or…? 3117 Butterfly Shasta Lake City CA 96019. This wonderful Windsor Estates home is located less than 8 miles to Bridge Bay on Lake Shasta. Enjoy the best of the Lake Shasta lifestyle! Now with a reduced price! This entry was posted in New Listing and tagged New Listing on December 29, 2016 by Skip@RHB. Starview Estates home offers economical and efficient living. Bright and open kitchen with modern appliances and materials. Easy to maintain yard with patio. Short loop of a street with only neighborhood traffic. Nearby to walking trails at Clover Creek Preserve. 2344 Nebula St Redding CA 96002. This entry was posted in Affordable housing, New Listing, Price Reductions and tagged Affordable housing, New Listing, Priced reductions, Redding on December 18, 2016 by Skip@RHB. New listing! Exceptional Gold Hills home! This entry was posted in New Listing and tagged Gold Hills, New Listing on December 14, 2016 by Skip@RHB. Palomar built home in west Redding! Corner lot with no neighboring home in back. Soaring vaulted ceilings, arches, and architectural ledges add interest and a spacious feel. Ceiling fans throughout. Bright laminate counters with subway tile backsplash. Transom lighting at master bedroom increases natural light. Expansive back patio stretches nearly the entire length of the back. Inviting year round indoor/outdoor living. Low maintenance back yard with dwarf citrus trees. Finished garage with painted floor. Inside laundry room. Stucco exterior for low maintenance and energy efficiency. Desirable Mary Lake neighborhood offers easy access to walking and biking, and quick connection to city center. Don’t miss this one! Call us for a private showing. 2270 Oconner Ave, Redding, CA 96001. This entry was posted in New Listing, Redding, West Redding and tagged Homes for sale, Mary Lake, New Listing, Redding, West Redding on November 11, 2016 by Skip@RHB. Elegant home in Spyglass Hills of Redding! Elegant home in Spyglass Hills! Enjoy the best of Redding from this well appointed home in an established and super desirable neighborhood. Vaulted ceilings and bold architectural details throughout. Large gas fired Fireplace with carved mantle in Great Room. Light and bright kitchen boasts both breakfast bar and built-in upholstered dining nook. Semi formal dining opens to one of 2 back patios. Bedroom 3 setup as possible home office with double doors at entry. Skylight floods master bathroom with soft natural light. Gated full RV hookup with 30 amp service, large enough for any motorhome or motorcoach. Shaded work area alongside the RV space. Cool, east facing porch with brick accents for afternoon seating. Above ground pool with large deck. Fully landscaped .3 acre lot. Low maintenance, low water use landscaping in backyard. Approximately 771 sqft, 3 car garage with overhead storage. Great location for access to Bethel, Shasta College, or Simpson University! Don’t miss this opportunity! 11522 Vista Del Rio Redding CA 96003. Call now for a private appointment! This entry was posted in New Listing and tagged New Listing on August 12, 2016 by Skip@RHB. Cool with a pool in Mary Lake of West Redding! Enjoy the best of the West Redding! Enjoy the best of the west in the highly sought-after west Redding neighborhood of Mary Lake. A singular setting that backs up to greenbelt, at the end of a cul de sac. 2276 Wicklow Redding CA 96002. Shown by appointment only. You know what we say about location. This one has it all! Built in 1992, this 1583 sqft 3/2 home has so much to offer.Laminate wood flooring, bathrooms were both updated. Master bath has added a walk-in shower with 2 shower heads and a clawfoot soaking tub and walk-in closet. Master has French doors leading outside to the deck. Outside is fully fenced, RV parking, safety fence around the pool, and 3 Trex decks. Property backs up to the Greenbelt, so no backyard neighbors. House is angled so you don’t notice the side neighbors. On the cul-de-sac. Property extends approx 10′ beyond the pool safety fence. Front yard has been newly re-landscaped. Pool has the jetted lap swimming. AC/Furnace replaced 2 years ago. Water heater last year. Roof is approx 10 yrs old and home has a security system. This entry was posted in New Listing and tagged New Listing on August 6, 2016 by Skip@RHB.